By the time she is two years old, Grace Rice, of Finksburg, Md., is beating her life expectancy by a year. But nobody knows it. Not her parents—both physicians—nor her local pediatrician, nor even a community specialist who was monitoring a minor endocrine imbalance. Grace, a bubbly, energetic child who loves trudging up hills, runs, jumps and kicks with ease as she keeps up with her two-years-older brother, Zachary. It's the last visit with her endocrinologist. While he listens to Grace's heart and lungs with his stethoscope, he picks up a faint, irregular sound as her heart beats—a heart murmur. A month later, just after Grace's second birthday, her pediatrician has to place her in several different positions before he, too, hears the murmur. He orders a chest X-ray and an electrocardiogram (EKG) to check for electrical problems in her heart. By mid-December 2012, the results are in. The EKG is abnormal. The pediatrician recommends Grace see a pediatric cardiologist. On January 15, 2013, Grace's mother, Dr. Kathy Weishaar, takes her to the University of Maryland Children's Hospital (UMCH), in Baltimore. Dr. Weishaar, an adult internal medicine specialist who earned her medical degree from the University of Maryland School of Medicine, chose UMCH because she's familiar with the high quality of care that School of Medicine faculty physicians provide at the Children's Hospital and the University of Maryland Medical Center. Grace undergoes another EKG and an echocardiogram (also called an echo), which uses sound waves to create a moving picture of the heart. "We assumed it would be a benign murmur, but when they told us the diagnosis, I was floored," says Dr. Weishaar. "They said it was so serious, they didn't want to send her home. It was kind of surreal, all very emotional." "I was shocked," says her husband, Dr. Robert Rice, a cancer specialist. "When the doctors at the University of Maryland Children's Hospital saw Grace's ultrasound, they knew immediately what the problem was and took immediate action. She needed to be admitted; she needed surgery the next day." "Grace has heart failure," says a pediatric cardiologist at the University of Maryland Children's Heart Program. "Her heart is not working the way it should because she was born with a very rare heart abnormality that produces a series of low-grade heart attacks," says the physician. Technically, Grace's condition is called Anomalous Left Coronary Artery from the Pulmonary Artery (ALCAPA). Normally, the left coronary artery emerges from the aorta and supplies blood to the heart tissue. In Grace, the left coronary artery came off the pulmonary artery. The pulmonary arteries normally take blood from the heart to the lungs. Pressure in the pulmonary artery is much lower than the aorta. Essentially, Grace's heart muscle was starved for blood flow because of the lack of pressure and was getting desaturated blood from the pulmonary artery, not the freshly oxygenated blood normally found in the aorta. Heart failure in children usually shows up early as a lack of endurance, but Grace had endurance. She could keep up with her playmates. The key was her heart murmur. Tracking down the source of the murmur led to the solution. Grace's mom, Dr. Weishaar, knew something about embryology and human anatomy from her days as a medical student, and all the twists and turns in the blood vessels going to and from the heart. "I remember thinking a lot has to go right for your child," she says. As she learns more about Grace's condition, she understands why quick action is necessary: "These kids can have heart attacks and then die of sudden death." Despite Grace's stunning diagnosis, her doctor points her parents to good news in all this: "Grace had developed collateral vessels, additional arteries that send blood to the left side of her heart, the main pumping chamber. These arteries supplemented the reduced blood flow coming from the pulmonary artery, contributed to her endurance, and kept her alive much longer than most children with ALCAPA." 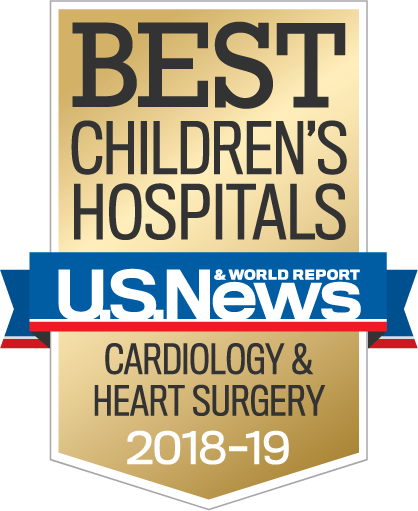 As soon as the director of pediatric cardiac surgery at the University of Maryland Children's Hospital, Sunjay Kaushal, MD, PhD, hears about Grace, he postpones all the surgeries he had planned for the next day. Dr. Kaushal, associate professor of surgery at the University of Maryland School of Medicine, knows time is against Grace. "In most cases, children with ALCAPA have symptoms much earlier, but Grace had just turned two. Her heart's main pumping chamber, the left ventricle, had depressed function. While the collateral vessels made it possible for her heart to compensate for the reduced blood flow from the pulmonary artery, we could not risk delaying the surgery," says Dr. Kaushal. "Dr. Kaushal was amazing," says Grace's mom. "He did a good job of explaining the surgery, appropriately positive, but not unrealistically positive. He showed us an echocardiogram of another girl with a similar diagnosis who was referred to Maryland for a heart transplant. After having the repair surgery, the other patient's heart improved dramatically, so much so that she did not require a transplant. It was nice to hear that." The next day, Grace undergoes what Dr. Kaushal calls a routine and straight-forward surgical procedure, during which the coronary artery is taken off the pulmonary artery and attached to the aorta, restoring normal anatomy and blood flow. For her family, it's an experience they'll never forget. "As a cancer doctor, I'm used to dealing with a lot of life and death issues, and things that happen all of a sudden, out of the blue," says Grace's father. "It's one thing to hear about it, another thing to experience it. You don't know how devastating something's going to be until it happens to your kids, or until it happens to you," says Dr. Rice. "This definitely has a big impact on us." As he learns more about ALCAPA, Dr. Rice is struck by how long Grace was able to survive without symptoms. "Symptoms are usually noticed in most of these babies by three months. In utero, blood and oxygen comes from the mother. After birth, the blood supply becomes more dependent on the baby's aorta as pressures come down over time. About 90 percent of children with ALCAPA are dead if they don't have corrective procedures by the time they are a year old. So, it's kind of amazing that Grace is doing so well." Over a year after the surgery, you wouldn't know that doctors once feared Grace would die at any moment. Grace sailed through the surgery and recovery, says Dr. Kaushal. "Some of these babies do get very, very sick, but she tolerated the surgery and did well after the operation and continues to do well since then." Dr. Weishaar and Dr. Rice say their experience with Grace has brought the family closer together and provided fresh insights as both parents and physicians. "In retrospect, we feel truly blessed. Grace could have been one of those kids on the playground who goes down and that's it," says Dr. Weishaar. "Today, she's a three-year-old in pre-school, playing some soccer and taking dance class. Speaking from a physician perspective, my husband and I were incredibly pleased with the care Grace received at the University of Maryland Children's Hospital, and the care she continues to receive." Adds Dr. Rice: "The physicians, nurses, the staff, everyone at the University of Maryland have been fantastic. It's a terrible circumstance that this happened, but we're very blessed that we had all this expertise available." To make an appointment with the Children's Heart Program, please call 410-328-4348.